A Little Oryx in Qatar: Abu Dhabi: Bus to Dubai! I've always driven between Dubai and Abu Dhabi but this time V and I decided to try out the bus operated by flydubai (http://www.flydubai.com/en/about-us/bus-service/). 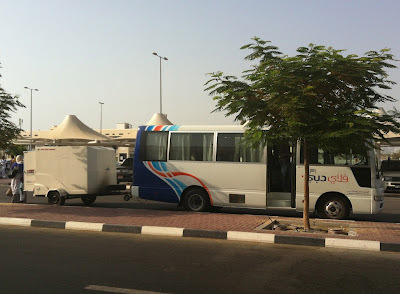 The bus stop in Abu Dhabi is this Al Masaood Tourism & Holidays. We got there 30 minutes before departure time and the office was closed and there was no one around. I called the flydubai main number and the guy told us to just wait until about 10 minutes before departure. Sure enough, a few minutes before departure time, the bus showed up! We left right on time and everything was very professional. The ride to Dubai was smooth and comfortable and completely safe (even for 2 girls). I definitely recommend this easy method of traveling between the cities. We even arrived early in Dubai! The little trailer on the back was so cute. We were dropped off at the Dubai Terminal 2 Departures.